Clements Ridge was a little farther out than the other tasting rooms we visited, but it was well worth the trip both for the wines and the beautiful tree-lined drive with views of the Snow-capped Sierras. At first we weren’t sure we were pulling into the right place. Clements Ridge is a family-run produce market, with an attached tasting room. Once we saw the banners proclaiming “Wine Tasting” we knew that we were in the right place. Nikki: "I'm styling your hair with my mind." The wine room at Clements Ridge reps several local wine labels. 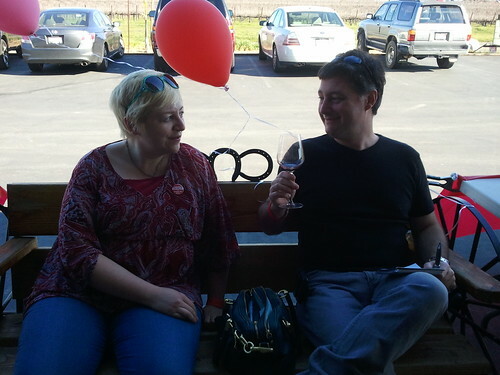 To accommodate the higher traffic the Wine and Chocolate event would bring, they had set up tasting stations for a couple of the wineries in the front outdoor seating area. A variety of noshes were offered on tables just inside the main store. The main distinguishing feature that made Clements Ridge a must-visit was that they were going to be pouring some German-style wines. 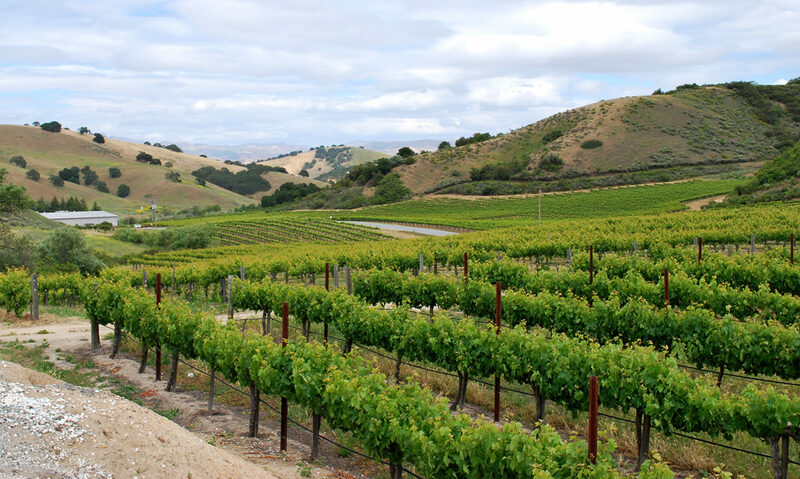 Wine regions often focus on a pretty specific style of wine – in Lodi it’s Zinfandel, in Monterey it’s Rhone-style wines – so when someone’s doing something different like German or Spanish style wines it’s a nice addition to the roster. Nikki has some great notes/thoughts about the wines we tasted, so when she’s off work I’m going to strong-arm her into adding them to this post. For the time being, you’re stuck with me. 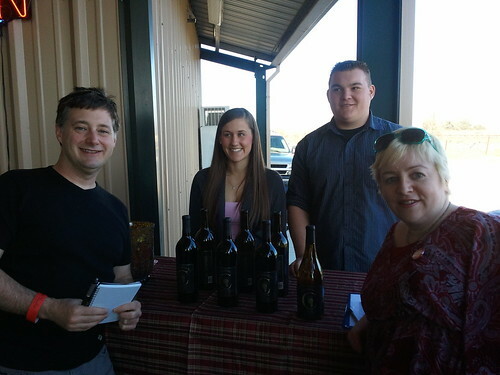 We started our tasting with Mokelumne Glen (www.mokelumneglen.com), the winery offering the German varieties. They also offered a sampling of German sausage bites which paired well with some of the wines. Gewurtztraminer: This is my kind of white wine. Very fragrant fruit-and-floral nose, which continues on into the flavor. Notes of pear and peach under a soft floral perfume. Nikki adds: I also tasted the pear, and a hint of grapefruit, plus a little Granny Smith apple. This would make a great summer wine. Kerner: The lighter, less fruity cousin of the Gewurtztraminer. I think I would have appreciated the Kerner more if I had tried it before the Gewurtztraminer, but because I had it after the Gewurtz it seemed a bit like a toned-down version of that wine. Nikki adds: I tasted Granny Smith and sweet pineapple, so it seemed plenty fruity to me! Zweigelt: This is a red wine that opens with fruit and closes with tannins. The tannins seem to get harder at the end. I don’t prefer a wine like this as a sipping wine, but I think it would be great with rich-flavored foods. Dornfelder: Another red. A bit of ash in the aroma. The flavor is marked with notes of ash, earth and tobacco. More accessible than that description might imply – it’s a stately, well-balanced wine. 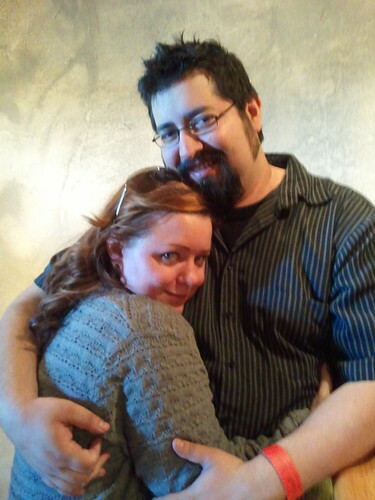 Nikki adds: I think I was hitting palate fatigue here, because it seemed very astringent to me. We then moved on to the offerings of Costamagna (they do not appear to have a website). Nikki adds: They don’t, but some digging reveals that the Costamagna family own a grape and cherry farm and a company called Delta Packing that sells said fruit. I’m going to see if I can learn more. Thoughts, l-r: "I'm hot." "What's up with the hair?" "Dude, seriously." "Yeah, he's mine." Chardonnay (missed the vintage on this one): Light fruit at the beginning which develops a cascade of butter, caramel, and pink bubble gum. I was pleased to taste such a layered wine – much of what we had been tasting was delicious but lacking in complexity. This was a welcome exception. Nikki adds: I called this a “candy Chard.” It is very easy drinking, and has everything that Mike describes and more. 2008 Barrel-Aged Zinfandel: Fruity, almost jammy with blackberry developing into a rich flavor backed by soft tannins. Nikki says: There was a candied taste to this that I quite liked. 2004 Barrel-Aged Cabernet Sauvignon: Cherries, ash, tannins over a nice warmth. A bit more formal than the Zin. Nikki adds: It smelled like sugar candy in an oak forest and tasted like a candy-coated acorn. Or maybe what a candy-coated acorn would taste like to a deer, because an actual candy-coated acorn would be pretty gross. Port (Oops, didn’t note the vintage): Unexpected developments on the tongue! It opens with sweet fruit, then crescendos to tannins which then clear to reveal even more fruit, this time with hints of chocolate. It’s like a dessert wine that has its own dessert at the end. Nikki adds: Sweet and tart, but not like a sweet tart. It reminded me of chocolate-covered blackberries. 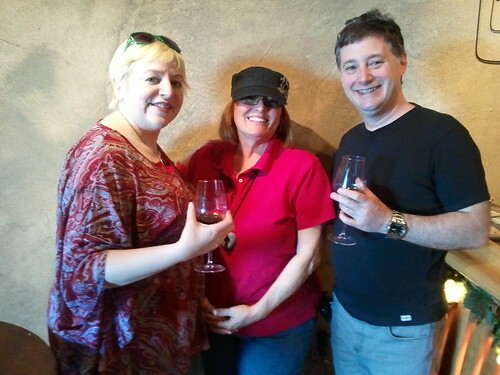 After Costamagna we moved into the wine room proper and enjoyed the wines of Gatos Locos Winery. They also do not appear to have their own website. More information is available at the Clements Ridge website. 2007 Chardonnay: A sweet hit of pineapple melting into butter. Nikki adds: This Mokelumne River wine was fermented in stainless steel. It was fruity and enjoyable, with a hint of caramel at the end. 2006 Santa Cruz Mountains Pinot Noir: Tannins up front fade to reveal a richness that has fruit, but is not jammy. 2007 Clements Hills Syrah: Earthy, ashy hints which I enjoyed. Also had a faint taste of fresh-baked bread. Nikki adds: And our third appellation of the trip! 2007 Mokelumne River Zinfandel: This one just hit my palate wrong, and I’m not sure why. I got a taste of plastic up front which then cleared to reveal fruit, then the flavor just dropped off. I’d like to give this a try again sometime to see if it makes a different impression. Nikki adds: This hit my palate right. It smelled of chocolate and cinnamon and tasted of grape, tomato and molé. Stealth Syrah: We called this Stealth Syrah because it came from an unlabeled bottle. It was essentially a barrel-tasting of a wine slated for release in the summer of 2011. It was dark and velvety despite its youth, and should develop into a real palate-pleaser. Debbie, rockin' the winery hat, poured the Gatos Locos wines for us.